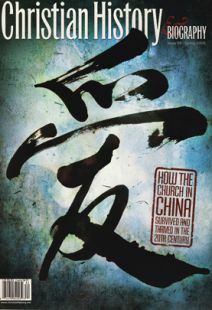 Though his ministry lasted only a dozen years, John Sung blazed a flaming trail of revival across China and most of Southeast Asia. Born the son of a pastor in southern China in 1901, he was sent by his family to the United States for theological study. Instead, he enrolled in a university and went on to earn a Ph.D. in chemistry. A guilty conscience then led him to Union Theological Seminary in New York, where he was converted after hearing a young evangelist whom his fellow students mocked as too simplistic. As a fresh convert, Sung was so zealous that the seminary president had him committed to an insane asylum. For the next 193 days, he read the Bible 40 times. On his way back to China, he threw almost all his diplomas overboard (except the Ph.D. to show his father) and dedicated himself to full-time evangelistic work. From 1928 to 1940, Sung traveled all over China and also Singapore, Indonesia, Malaysia, the Philippines, Taiwan, and Thailand. He preached to large crowds, some of whom walked long distances in bad weather to hear him. A painful physical ailment sometimes forced him to preach sitting or even lying down. Tens— perhaps hundreds—of thousands were converted through his ministry. He never emphasized miracles, but countless people were healed through his prayers after he had preached. Despite multiple threats on his life, narrow escapes from death, and repeated warnings from powerful people, Sung fearlessly denounced sin and called for total faith in Christ and radical obedience to the Great Commission. Especially in his early years, he often exposed the faults of church leaders publicly; some hated him for it, but many more humbled themselves and changed their lives. A good way to follow Lewis’s thought is to read what he read.